Benson was born in Shropshire, of well-off but unhappy parents. She filled her isolated and sickly childhood with writing in her diary, and creating a secret fantasy world. She later claimed she greeted one governess, when she was 8, with the words “I am young, but I have had a great deal of sorrow in my life” (Roberts, 14). (This was possibly no more than a reference to the death of her elder sister Catherine the previous year.) She was educated at home, and spent short periods in schools in places like Eastbourne and Freiburg. She spent seventeen happy months in Switzerland (a health cure, as she attempted to recover from pleurisy), but her health remained very poor, and a trip to Jamaica towards the end of 1913 was also partly for her health. Her first novel, I Pose (1915), drew on her West Indian experience, but also on her work for suffragist organisations and for charities working in London’s East End. Of this novel George Malcolm Johnson writes, “Its originality lies in its radical subversion of the traditional closure of romance in marriage: Benson has the suffragette heroine defiantly hurl a bomb at a church altar.” Her second and third novels are discussed under her War Experiences, since they are both concerned with the War. 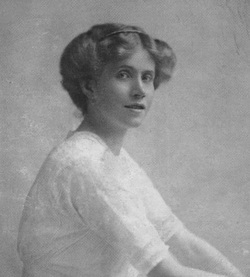 On Saturday 2 May 1914, after a good deal of planning, Benson left home and went to live on her own in London. To start with she tried working in the “Literary Department” of the Women Writers’ Suffrage League, in Henrietta Street (Covent Garden). Again, she fell ill, and tuberculosis was again raised as a possible diagnosis (she was coughing blood). It was not TB, but a doctor recommended going to healthier climes and said she should only do light work until the summer: “It is evident that Providence is trying to bully me into being a gentle anti-militant, and an ordinary soft and pretty girl with flirtation for a hobby […] But I will not be bullied” (quoted Grant, 53). She began work on I Pose, her first novel. And she offered her services to the United Suffragists at their office in Adam Street, off the Strand. She proudly went on the People’s March from Bow to the House of Commons, organised by Sylvia Pankhurst, on 11 June 1914, and she continued working for the suffragists in the early part of the war; see here for her experiences during the War. In 1918 she travelled from New York to California, and worked at various jobs, but the vulgarity of America upset her. In 1919 she travelled to China, where she stayed the rest of her life. She taught in Hong Kong, and worked in a medical institute in Peking. She met James Anderson in China, and married him in London in 1921. She wrote a satirical novel about California, and travel books, and achieved great success with The Far-Away Bride (1930) (called Tobit Transplanted in the UK edition, 1931), which was about White Russians exiled in Manchuria. She and her husband returned to Hong Kong, and she helped in a successful campaign against licensed prostitution. On a visit to Indo-China she contracted pneumonia and died there in hospital in 1933. George Malcolm Johnson’s article in the Oxford Dictionary of National Biography gives a basic account of her life, but I have supplemented this with information from R. Ellis Roberts, Portrait of Stella Benson (London: Macmillan, 1939) and Joy Grant, Stella Benson: A Biography (London: Macmillan, 1987).